I missed last Friday, didn’t make any posts, I think we came back home from a road trip very late on Thursday night and I didn’t have any energy to do it. Last night I came home from work pretty late as well, but decided that skipping two in a row would not be cool, so I pulled one from the archives to share with you. So if you know where it is then speak up and let the world know as well! Weekend Update: Well, well, well, many good guesses on it, but this week mystery photo proved to be a true mystery as no one identified the place. 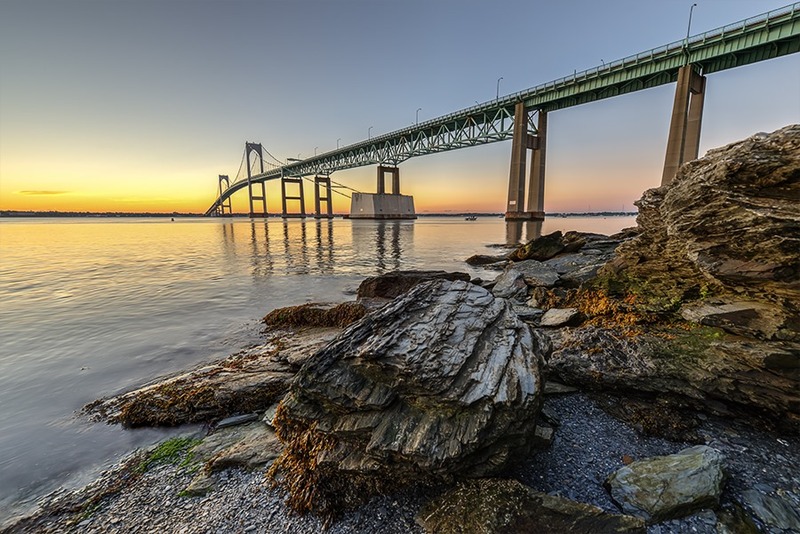 This is Claiborne Pell Bridge over the Narragansett Bay in Newport Rhode Island. This entry was posted in Newport, Rhode Island and tagged Friday Mystery Photo; Claiborne Pell Bridge. Bookmark the permalink. Is it Brooklyn Bridge? Saay yes! Chesapeake Bay Bridge in Maryland?? In any event, gorgeous shot! Looks a little like the Tappan Zee bridge between Rockland and Westchester counties. Love the photo and the way those rocks at the water’s edge are glowing! Looks like the Chesapeake Bay bridge. I’m with Fischer and Becca; I say it’s the Chesapeake! Looks like the Mackinaw Bridge in Michigan. Rats, I had poured over so many American bridges but to no avail. At least I have learnt more about your bridges in the last couple of days than I ever have 🙂 Thanks for a good search though Dimitri! I went to high school in Rhode Island. I miss that place….